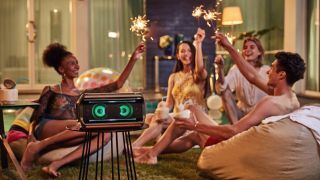 LG certainly isn't holding back on its growing range of XBoom speakers, with audio kit for taking on the go, partying at home, or absolutely decimating your neighbour's eardrums. The main areas of interest are the portable and outdoor-friendly PK3, PK5 and PK7 Bluetooth speakers (XBoom Go), as well as the Google Assistant-enabled WK9 and WK7. Crucially, these Bluetooth speakers now support the 'lossless' aptX HD compression format, minimizing the drop in quality you get when streaming hi-res audio (24 bits) wirelessly. There's a new flagship mini-component sound system, the CL98, capable of blasting at 3,500W - with a built-in 'compression horn' to ensure clarity at high frequencies, even when you're reckless enough to turn the volume up to max. Party-minded features like the DJ App for easy mixing and fading are included, and a Karaoke Star setting for suppressing vocals on desired tracks also provide a much more fleshed-out package than simply music playback. LG has recently brought a number of new wireless and smart speakers under the XBoom banner to help it better compete with the likes of UE and Sonos. We'll be getting a closer look (listen?) at LG's XBoom speakers next week at CES 2019, the international tech expo that typically sees a host of new product announcements and launches for the year to come. Alongside big plans for LG's smartphone range and OLED televisions, it looks like LG is continuing its strong presence and variety of launches at the show - but we'll keep you updated with all the most important updates and announcements here at TechRadar.